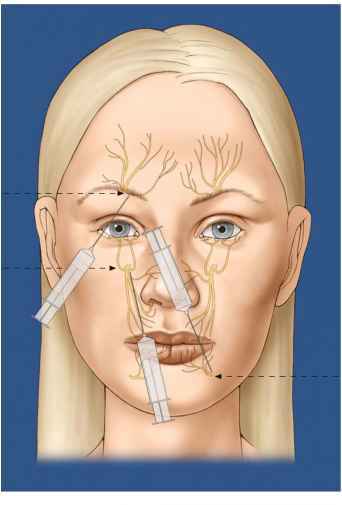 Figure 3 Gonadotropin-releasing hormone antagonist multiple- and single-dose protocols. Fixed day regimens. Abbreviations: FSH, follicle-stimulating hormone; hCG, human chorionic gonadotropin; hMG, human menopausal gonadotropin. was started on day 6. 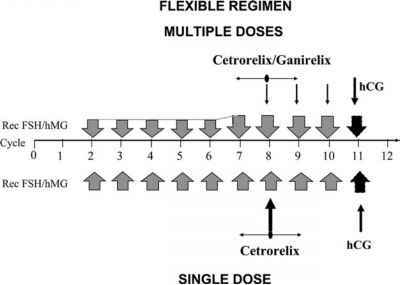 In the single dose, the 3 mg administration of Cetror-elix was proposed on day 7. We proposed a more flexible approach by adapting the moment of antagonist administration to ovarian response (Fig. 3) (11). The antagonist could be administered when the leading follicle reached 14 mm and/or E2 reached 600pg/ml. The same approach was later proposed by Ludwig et al. (57) in the multiple-dose protocol (Fig. 3). Some authors have predicted a lower pregnancy rate when the flexible approach was proposed (58). Data remain controversial on this question. 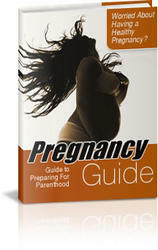 A recent meta-analysis did not find differences in the pregnancy rates between the flexible and fixed approaches (59). A very early start of the antagonist, injected at the beginning of the stimulation, was proposed to reduce the LH levels at the beginning of the follicular phase. A prospective randomized study failed to demonstrate an advantage to this proposal (60). Moreover, a long period of injection of antagonist will really alter the main benefit of GnRH-nts.